Produktinformationen "Korean Philosophy: Its Tradition and Modern Transformation"
The philosophy and patterns of thought of a civilization contain the historical experiences, life wisdom, and cultural ideals accumulated by a people over a long period of time. In this sense, the wisdom and ideals that are reflected in a civilization's philosophy speak a great deal about its particular cultural identity. Korean philosophy is no exception. Indeed, Korean philosophy reflects the legacy of life experience and cultural ideals accumulated by the Korean people over time. Continuously struggling to preserve its identity, traditional Korean philosophy was finally confronted with the turning point of modernity, in the face of which it had no choice but to walk the path of reform and innovation. Confucianism and Buddhism, which played a dominant role in Korean intellectual circles until the premodern period, were now forced to meet the challenges posed by this modernity, and sought to transform themselves appropriately. This volume is a compilation of previously published articles in the field of Korean philosophy that have been carefully selected for their high scholarly value. Articles in this volume include those introducing major trends in Korean philosophy in a concise manner: articles concerning reform in traditional philosophy in response to modernity, and those concerning the significance of traditional Korean philosophy today. This volume will provide the reader with a great deal of information on the past, present, and future of the field. I hope that it will serve as a useful guide to Korean philosophy and thought for the readers interested in Korean Studies. 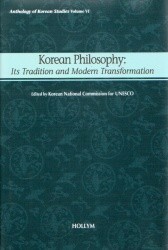 Weiterführende Links zu "Korean Philosophy: Its Tradition and Modern Transformation"
Unser Kommentar zu "Korean Philosophy: Its Tradition and Modern Transformation"
Kundenbewertungen für "Korean Philosophy: Its Tradition and Modern Transformation"